The small Northeast Kingdom city of Newport boasts a Catholic church of staggering proportions. Built of local granite, it sits on a dramatic perch overlooking Lake Memphremagog and nearby Canada. Its twin towers are 105 feet tall, its walls nearly three feet thick. It seats 550 people on pews that cant gradually toward the altar on a theater floor. It's more impressive than Vermont's only cathedral, the Cathedral of St. Joseph in Burlington, which is the bishop's seat. 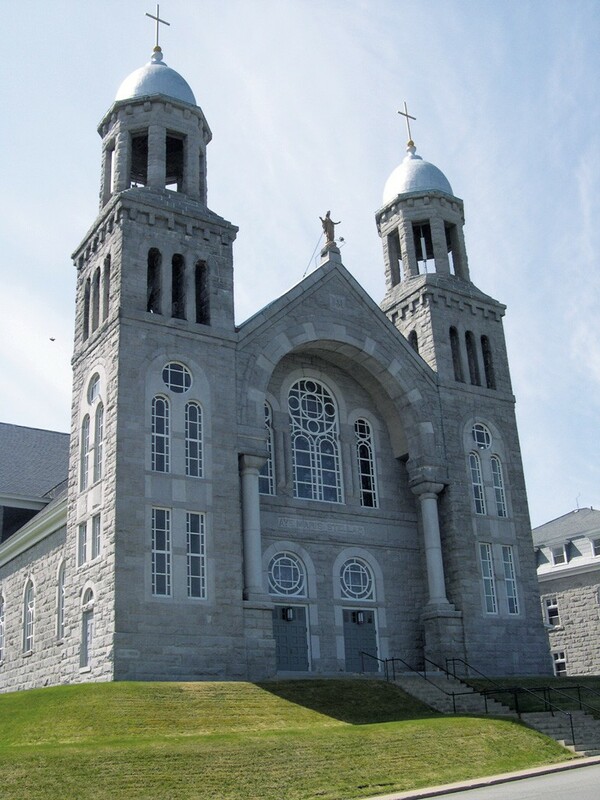 By all appearances, this grand Romanesque monument — christened St. Mary Star of the Sea in 1909 — should be in Montréal or Boston, not in a town whose population has never topped 5,300. But St. Mary's founder, Father Antoine Clermont, was a "visionary" who "didn't care about the budget," Fred Wilson explained wryly while giving Seven Days a recent tour. Wilson emphatically does care. Now the church's consultant and project coordinator, he served until June as office manager for Mater Dei Parish, to which St. Mary belongs, one of 73 parishes in Vermont. 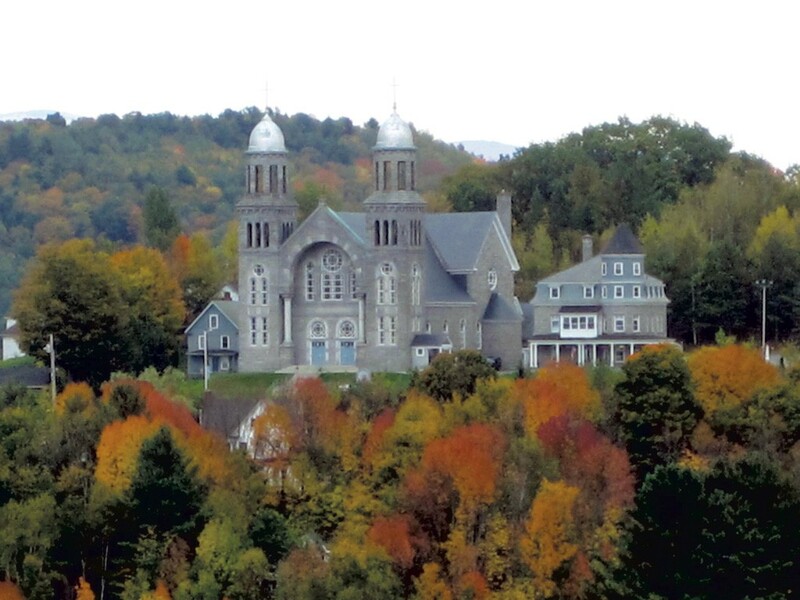 According to Glenn Andres and Curtis Johnson's book Buildings of Vermont, when Clermont launched the extravagant church's construction in 1904, the Vermont diocese sought to block it. That failed, so the diocese placed Clermont "under interdiction for his obstinacy" and transferred him just before the building was completed. 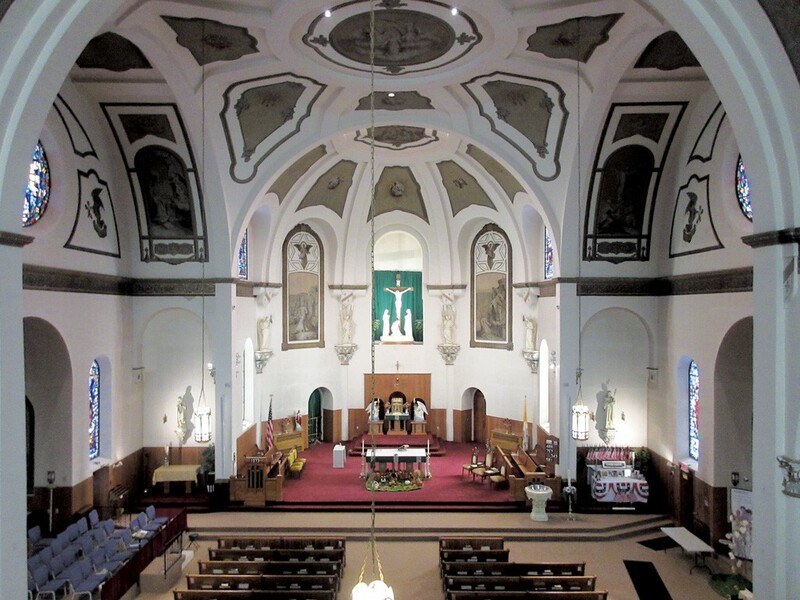 The bankrupt parish didn't pay off its debt until 1946, according to a commemorative book printed for the church's 2009 centennial. These days, churches such as St. Mary have to consider budgetary matters very carefully. According to a survey, Vermont is the least religious state in the nation. Church attendance is reportedly down across all faiths, and the Catholic Church has taken an added hit from revelations of its priest-abuse cover-up. The collection basket is getting shallower while maintenance costs continue to mount. Yet no one wants to see Vermont's iconic churches — many of them in rural towns — go away. "We have these architectural gems that were built to last a thousand years," said Lisa Ryan, a field service representative with the Preservation Trust of Vermont. Along with farms, forests and beautiful winding roads, Ryan said, "churches are a big part of our Vermont identity." While St. Mary may have begun as an extravagance, today it's one of the state's healthiest churches. As Preservation Trust director Paul Bruhn commented, "The Newport church is an example of a church congregation that's working very hard to stay viable and vibrant. And Fred is an example of someone who is very passionate about both the building, which is amazing, and the church's mission." About 1,500 families are on the rolls of Mater Dei, whose churches are St. Mary, St. Edward the Confessor in Derby Line, St. Benedict Labré in West Charleston and St. James the Greater in Island Pond. (The parish used to include St. Bernard of Clairvaux in Norton, but that remote border structure was decommissioned owing to dwindling attendance in 2009 and is up for sale.) While off-season Sunday attendance fills perhaps half the pews, the church is generally full during busy summer months, and Christmas masses draw a standing-room-only crowd. "That's more than I had in New Jersey," said Father Rijo Johnson, St. Mary's voluble, upbeat pastor from Kerala, India, who is one of the parish's three priests. Johnson served in Newark, N.J., for 10 years before coming to Newport in July 2017. Seven Days reached him by phone in the rectory beside the church, a smaller but equally beautiful granite structure with a round tower facing the lake. Johnson has reached out to the larger Newport community in numerous ways. He opened the annual picnic — organized by the church's active Knights of Columbus — to the public, giving more than the congregation access to the church's "million-dollar view," as Johnson put it. Public concerts by a children's bell choir from the town's multidenominational United Christian Academy typically fill the church. Last July 4, Johnson began serving ice cream to fireworks watchers who hauled chairs up to the church grounds. Annual outdoor vehicle and pet blessings regularly take place in the parking lot. The church also provides gas vouchers and bagged groceries to needy visitors and to 15 to 20 families every Thursday. Nancy Cook, a Eucharistic minister at St. Mary and retired director of Passumpsic Savings Bank, described St. Mary as one of four Newport churches that coordinate their efforts to tend to the community's needs; the others are St. Mark's Episcopal Church, Newport Church of God, and a single institution known as the Federated United Methodist and United Church of Christ. Wilson oversees the physical church's restoration, an ongoing project that has cost an estimated $200,000 since 2008. Major grants of $50,000 that year and $40,000 in 2016, from a partnership of the Preservation Trust and the Carl M. Freeman Foundation, helped repoint the granite blocks, which had begun to shift because of crumbling mortar. An extra cash infusion occurred spontaneously during the centennial celebration. The late real estate mogul Tony Pomerleau, who grew up in Newport and attended St. Mary, pledged $25,000 if then-pastor Father Yvon Royer would shave his beard. Royer immediately complied, and the transaction was completed. "But I don't think he was happy when I grew it back," the priest wrote in an email. St. Mary's next project is the roof: It needs new copper crickets and some slate replacement, which will cost about $100,000, Wilson estimated. The money will come from a capital campaign, grants and parishioners' bequests. Meanwhile, Verizon's cellphone antennae, installed in both towers in 2006, provide rental income that's used for general operations. Inside, Wilson pointed out a chipped spot on the plaster-and-horsehair-on-lath walls. It reveals that white latex paint covers some of the original trompe-l'oeil detail by Naphtali Rochon. The Québécois artist based his grisaille renderings of the life of Christ, seen throughout the church, on originals by James Tissot, while inserting his own face in nearly every scene. (He is Christ up in the choir loft.) Unfortunately, a full removal of the latex layer is currently unaffordable, said Wilson. Nevertheless, St. Mary has avoided the fate of other churches around the state. Vermont's state architectural historian, Devin Colman, cited the case of St. Jerome's Catholic Church in East Dorset, built in the Carpenter Gothic style in 1874. The Catholic Diocese tore it down in 2016. "There was no regulatory 'hook' at the local, state or federal level to require consideration of alternatives to demolition," Colman wrote in an email. The same fate may await the Cathedral of the Immaculate Conception in Burlington, designed by well-known modern architect Edward Larrabee Barnes in 1977 to fit into a grid of trees designed by even-better-known landscape architect Dan Kiley. In October, the Cultural Landscape Foundation in Washington, D.C., warned in a "Landslide" alert that "the likelihood that the cathedral will be demolished is increased by its proximity to the upcoming CityPlace Burlington redevelopment project." The Preservation Trust works with a Philadelphia-based organization, Partners for Sacred Places, to reinvigorate churches of all denominations by "building the capacity of congregations of historic sacred places to better serve their communities as anchor institutions, nurturing transformation and shaping vibrant, creative communities." (Wilson is in the initial stages of talking with Partners for Sacred Places.) Annual Preservation Trust workshops hosted at the Grand Isle Lake House aim to show churches that "they can draw financial support from outside the congregation if they play a role in community life," said Bruhn. Some churches have actually managed to attract bigger congregations that way. When Todd Eaton began serving as pastor of the United Baptist Church of Poultney, five years ago, he found that the historically significant 1805 church had eight regular attendees, all older than 60. He opened the doors to the public for East Poultney Day and other local events, turning around an insular church culture. Recently he launched a fundraising campaign for major exterior restoration and accessibility work for $400,000, partly matched by the National Fund for Sacred Places. Regular attendees now number between 20 and 40, Eaton said by phone. The Methodist Church intended to demolish Grace Community Church in Canaan until a group of concerned community members attended a Partners for Sacred Places workshop. Now the restored 1874 building fills previously unmet community needs with weekly yoga and smoking-cessation classes, youth classes, community dinners, and more. Church attendance is up eightfold. Other churches have been successfully repurposed. The United Church of Christ donated its Putney church to the Putney Historical Society, which partnered with Next Stage Arts Project. Now the church is a gathering place with a second-floor performing arts center and movie house. The Episcopal Diocese downsized its two Brandon-area churches to one, selling its 1854 Gothic Revival Grace Episcopal Church in Forest Dale to a woodworker. The artist installed his workshop in the basement and uses the sanctuary as a gallery. In the unlikely event that St. Mary needs to be repurposed, its obvious next incarnation would be a concert or theater hall. For now, its proponents are working hard to keep people in the faith and attract new initiates. Johnson said 50 to 60 parishioners die every year. Deacon Ward Nolan currently has four people in his class for Catholic initiates, and about 110 children and their parents attend catechism classes. "We're really evangelizing now. It's imperative that we do because of the numbers of people falling away [from the faith]," said Nolan, who has served at St. Mary for six years and lived in Newport for 45. "We live in such a secular world, and relativism is the new religion." Cook recalled reading the commemorative book's description of the opening mass at St. Mary, which overflowed the space. "It's a sign of the times that the church pews are not being filled like they used to," she said. Nevertheless, "We are doing OK financially. We have some serious repair issues ahead of us. But we're hanging strong." The original print version of this article was headlined "Shining 'Star'"